1918: BG Marlborough Churchill became Chief, MID. 5 June 1918: BG Marlborough Churchill became Chief, Military Intelligence Division. Marlborough Churchill (born 1878 in Massachusetts) was a distant relative of Winston Churchill. He received an A.B. degree from Harvard University in 1900. He was commissioned in the Field Artillery Branch of the U.S. Army. 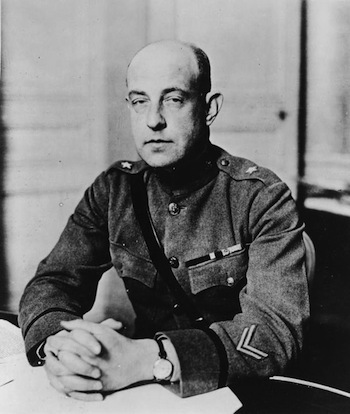 In 1917, Colonel Churchill served on the general staff of the American Expeditionary Force in France. On 5 June 1918 Churchill, then a Brigadier General, succeeded Ralph Van Deman as head of the Military Intelligence Branch of the War Department. He remained head until 19 August 1920. Together with Herbert Yardley, he was instrumental in establishing the joint State and War Department's Cipher Bureau, the American Black Chamber. General Churchill is a member of the Military Intelligence Hall of Fame.